We're getting an awful lot of big movies this summer. Lots that will thrill, and more than a few that will disappoint. Some folks will tell you they know one from the other just by the previews - don't believe it. There's one that's very up in the air for me - The Lone Ranger. On the plus side, it's a western (I love a great western), it has Johnny Depp, and it's directed by Gore Verbinski. The last time Verbinski and Depp teamed up on a western, that turned out great - Rango. There's plenty to make me worry though, not the least of which is that Disney tends to try too hard with these big blockbusters. Their success with Pirates of the Caribbean has led to some less than stellar attempts at creating other franchises, like John Carter, Prince of Persia, and even Haunted Mansion. And while I love Depp, if not properly reigned in by Verbinski, he can chew up the scenery and spit it out. Until the movie actually hits screens and we can all decide for ourselves, we have the action figures from NECA to discuss. 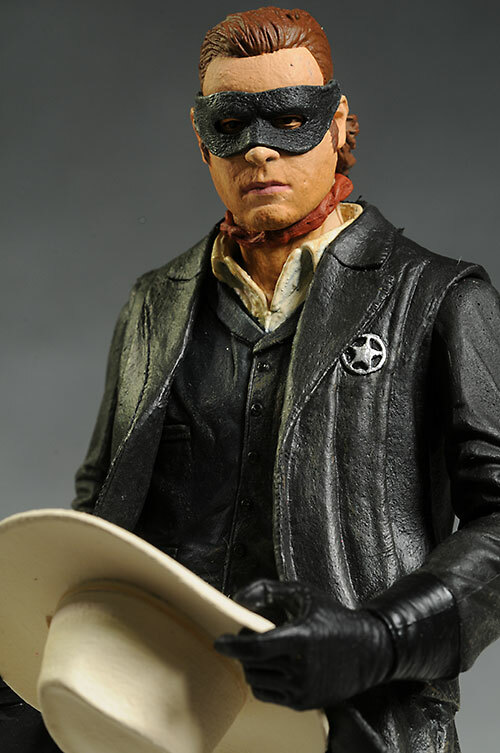 The 7" pair of Lone Ranger and Tonto are now hitting Toys R Us stores, and you can expect to pay around $16 or so each. Once upon a time, clam shells were THE new kid on the block, and they did a terrific job protecting the new collectible action figures on the pegs at Media Play, Suncoast and other retailers. Flash forward, and most companies have gone back to card back and bubble style packs. One of the reasons is simple - most of the companies that used clam shells are no longer in business, and the few that are have greatly reduced their output. NECA has hung with them, using some very nice inserts to add personalization and information for each series. Here, the inserts have a great desert theme, including the funky crows that are clearly so dear to Tonto. You'll have to use a knife to retrieve the figure, but I think that's a small price to pay for the much sturdier package. They've also done something slightly different here with the trays - the arms and legs go through the tray, so that twisties aren't necessary. There's still one or two around the body, but there's not the 5, 6 or more that can be such a pain to remove, and so unattractive to the MOCer. 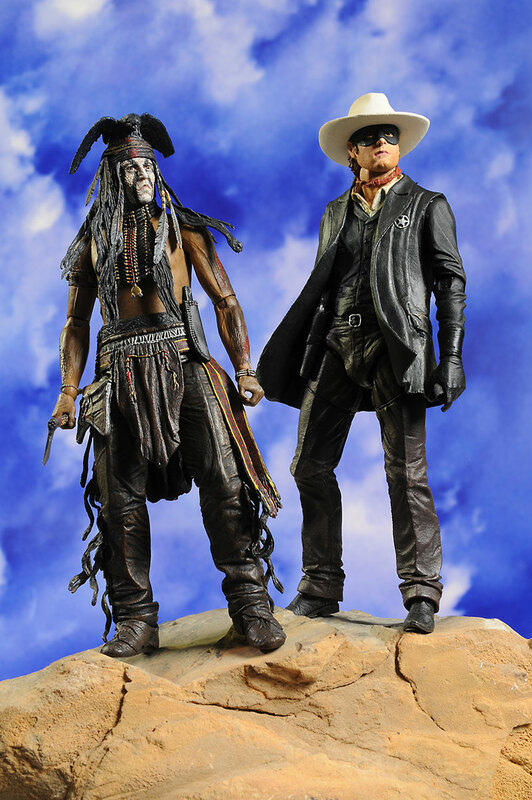 I'm very happy with both of these likenesses, although that's partly because Depp is so heavily covered in makeup he's hard to see, and Arnie Hammer doesn't have a particularly unique face, especially under the mask. The detail on the rest of the sculpt is what makes them stand out. I love the texture on Tonto's face, giving him almost a snake skin look. It implies the heavy, caked on mud-like makeup, which works with this character. 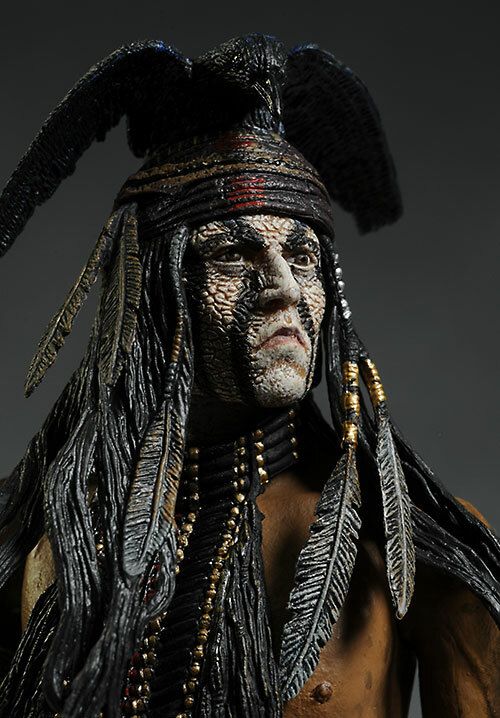 He also has a great looking outfit, with nice detailing on the various layers of leather, feathers and beads. I know some people have been freaked out by the crow on his head, but I really like it. It's certainly not a traditional look, and I think that's a smart move on Disney's part. 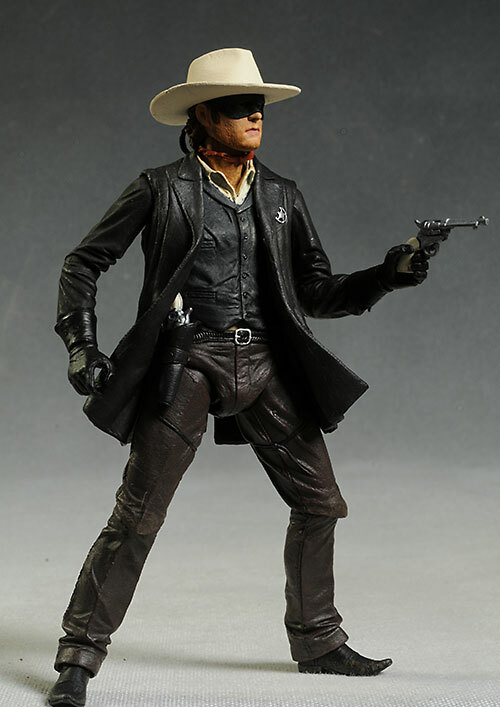 The Lone Ranger has a more traditional appearance, with well worn black western duds. I like the design on the knees, with the sculpted front coming down in front, hiding the joint. They've gone with this same look on Tonto too, and it works well. The mask on the Ranger is a separate sculpted piece, which is a good choice. It gives it the right depth on his face. It's not intended to be removed, since the face is cut back to hold it properly, but is designed to look very realistic in place. The hair is sculpted to work best with the hat, since that's the normal way most collectors will display him. Both figures stand about 7" tall, fitting in with most of the other NECA movie lines. I haven't seen info on any further figures - a Butch Cavendish would certainly be nice - but we only have a few weeks to San Diego Comic Con where we might get more details. One of the areas where I've been particularly hard on NECA over the last few years is their paint quality. There have been some ups and downs, but over the last 12 months (and with certain licenses) things have really improved. That continues here...generally speaking. 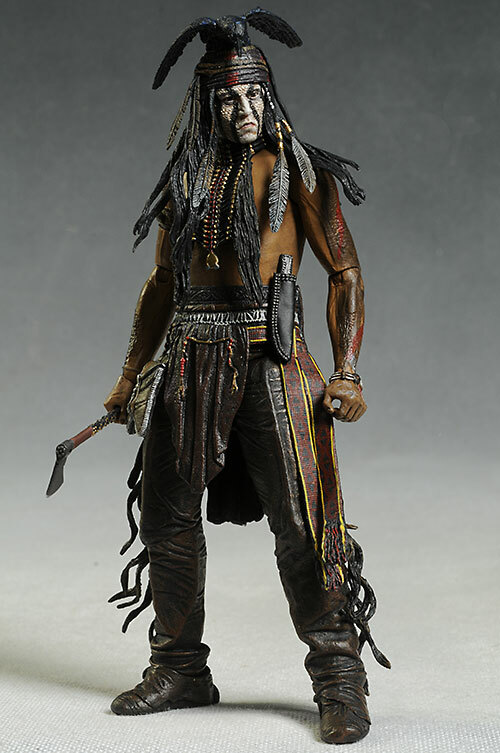 Tonto looks particularly good, with the cool face paint and even the smallest details done with a realistic approach. They didn't go overboard with color, allowing the small details to really pop out from the darker clothing. The Lone Ranger is decent, but not quite as nice as Tonto. I suspect the same will be true on screen. NECA tried to give him some stubble, but I didn't seen a single one that wasn't crooked or smudged to some degree. I had 4 or 5 to choose from, and took the best they had, but even so, the skin tone is a bit rough, and some of the cut lines are weak. I do like the use of different finishes on the black costume, like the shiny buttons and the more matte mask. The colors also pop here because of the predominately dark outfit, which allows the badge, buckle and other small details to stand out. 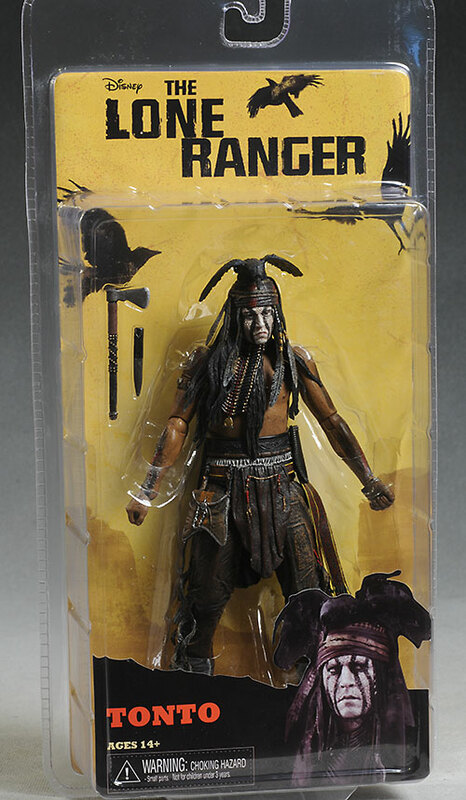 Although I like Tonto's paint job better than the Ranger's, there's still one issue. On both arms, the went with a heavy mud look, straight brown streaks down both. I just finished watching a 'making of' special, and Tonto's arms have a white striping in the war paint on the arms as well, breaking it up a bit and making it look a lot less like plain dirt. This was a big surprise for me, largely because NECA is not generally known for great articulation. Good articulation, but not great. They've stepped up their game recently, coming up with some very nice joints that are well hidden. There's a ball jointed neck of course, and I'm very appreciative. This joint provides the personality that you need for every pose. There's ball shoulders and hips too, as well as ball knees and ankles. That means they can take deep stances and keep their feet on the ground. 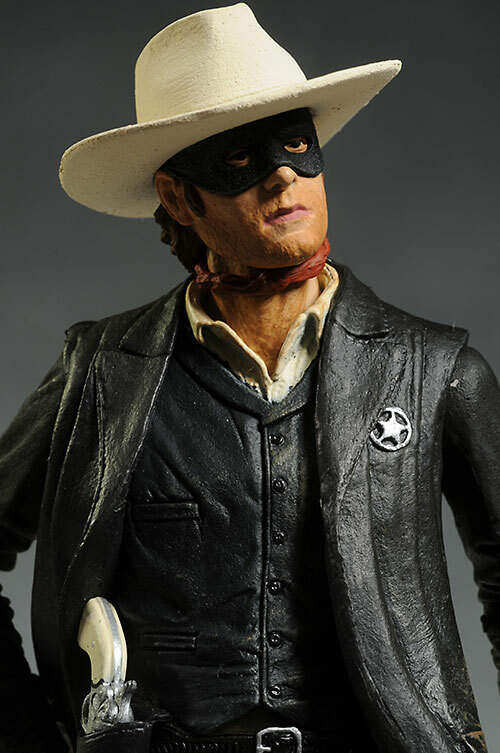 It works a bit better for Tonto though, since the pant sculpt on the Lone Ranger gets in the way. The knees move forward and back, as well as turn on the axis of the leg. The sculpt hides much of this joint too, always a big plus with movie accurate figures. There's a cut waist in there too. The elbows have the same sort of joint as the knee, although it's not quite as well hidden. The wrists are ball joints too - the fluidity of the poses and stances you can get is really quite impressive. It seems like accessories have become almost non-existent, even at $16 or $17 for a 7" figure. That's a serious negative for me. That's not a problem here, with both figures coming with the exact extras they need. 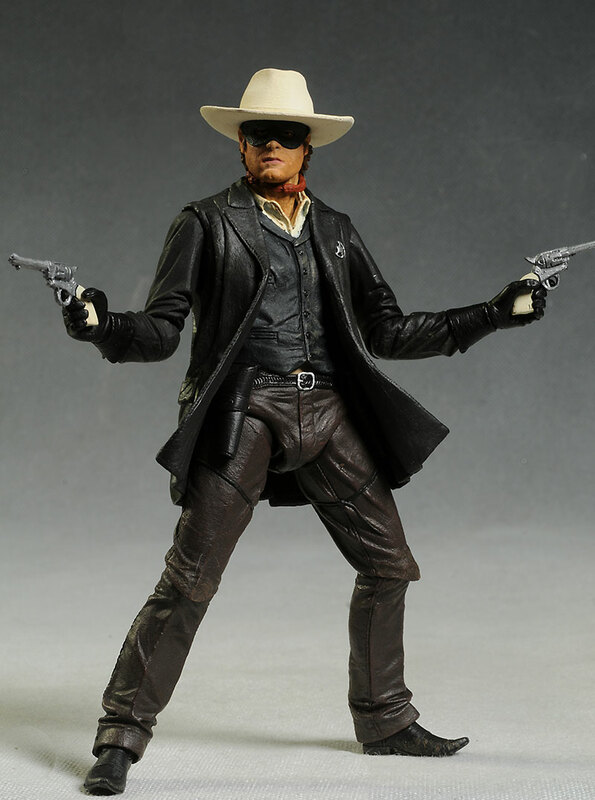 The Lone Ranger has his big white hat and two ivory handled revolvers, scaled perfectly for his hands. The revolvers can also fit inside the holsters, although the left is a bit tricky. The scale of the hat is good too, fitting his head tightly, and not looking too large from most angles. That's tough to pull off in this scale, where the rubbery material they use almost always makes the hat too large. 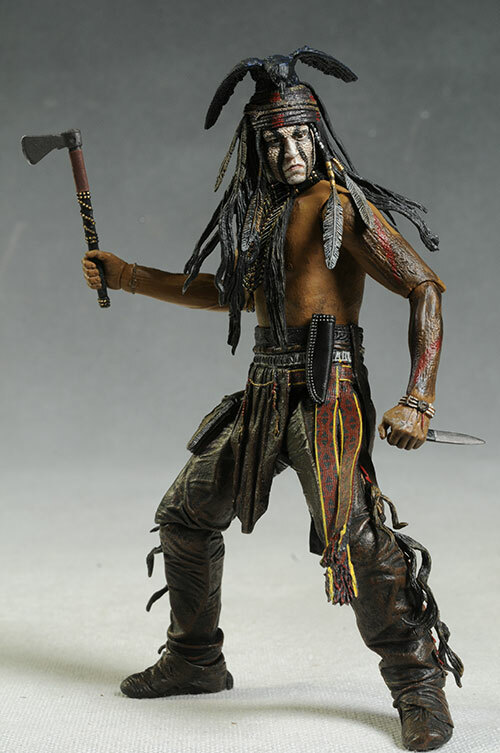 Tonto has two weapons - a knife, and a tomahawk. The knife fits inside a small sheath on his hip, and while there isn't a specific spot to put the hawk, you can fit it inside the belt. His hands are sculpted to work with these perfectly, and once again the scale is dead on. These are great action figures for kids and not just collectors. There's plenty of articulation for play, the accessories are perfect, and the sculpts and paint will give them the look they want. Just because they are kids doesn't mean they don't appreciate decent paint and sculpts, a mistake too many companies make. While the average price of $16 is still a bit stiff, at least we're getting a reasonable number of accessories and some great articulation for the price. You should be able to make your choice on the pegs with these, so go through them all and find the best looking paint that you can. When I first saw these on the shelf, I had a very bad feeling. That wasn't fair - NECA has upped their game in the last year or so, especially with paint and articulation, and these two are much better than I had anticipated. 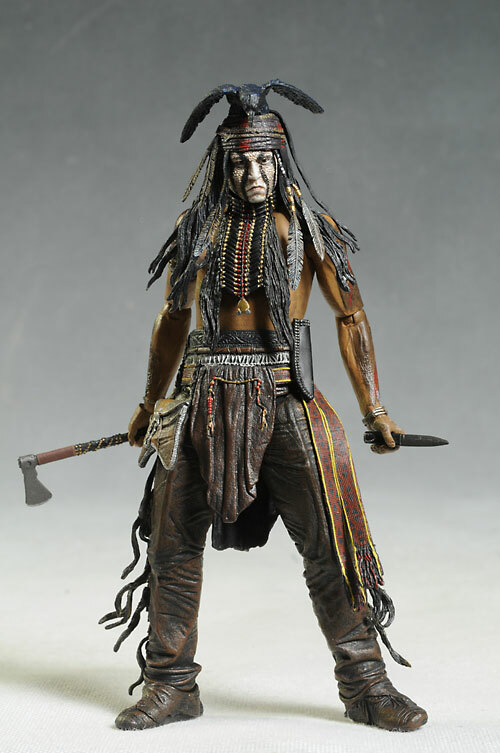 While Tonto gets all the visual uniqueness, the Lone Ranger is a solid design as well. Together, they look great on the shelf, and will fit in nicely with the other movie based figures from NECA, Mcfarlane and others. I have my fingers crossed that the actual movie can positively surprise me as much as the figures did - I'm going to do my best to keep an open mind til opening night. 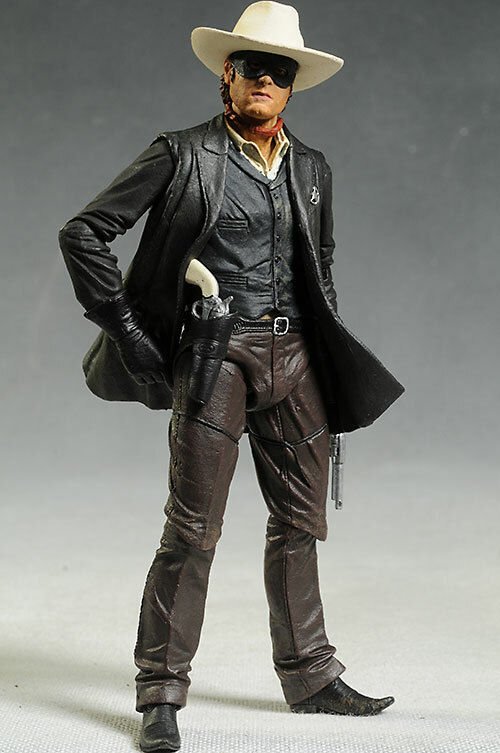 The quarter scale Tonto is on his way to my front door as well, so I should have a review up of him within a week or so. - has the pair for $37. - has them for $18 each. - Entertainment Earth is at $18 each. I haven't covered anything else from the movie...yet. Stay tuned for a look at the quarter scale Tonto very soon!